This allows blood to flow backwards and they enlarge even more. Varicose veins are most common in the superficial veins of the legs, which are subject to high pressure when standing. Besides cosmetic problems, varicose veins are often painful, especially when standing or walking. They often itch, and scratching them can cause ulcers. 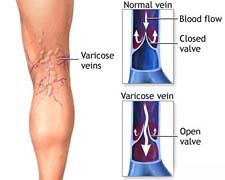 Contact Wecareindia for VARICOSE VEINS SURGERY in India.